A team of astronomers has discovered "monstrous baby galaxies" within dark matter structures 11.5 billion light years from Earth. Dark matter remains one of the most mysterious substances in the universe, which is no surprise considering we only figured out how to "see" it last year. But just as fascinating is the discovery of "monstrous baby galaxies" deep within its structures. That's exactly what astronmers found when they pointed the Atacama Large Millimeter/submillimeter Array (or ALMA) at a dark matter web and found a cluster of galaxies within its tendrils. And before we jump to the natural conclusion that dark matter is stealing galaxies from their cribs, the truth is far more intriguing - this is a glimpse into how the universe's elliptical galaxies formed roughly 10 billion years ago. 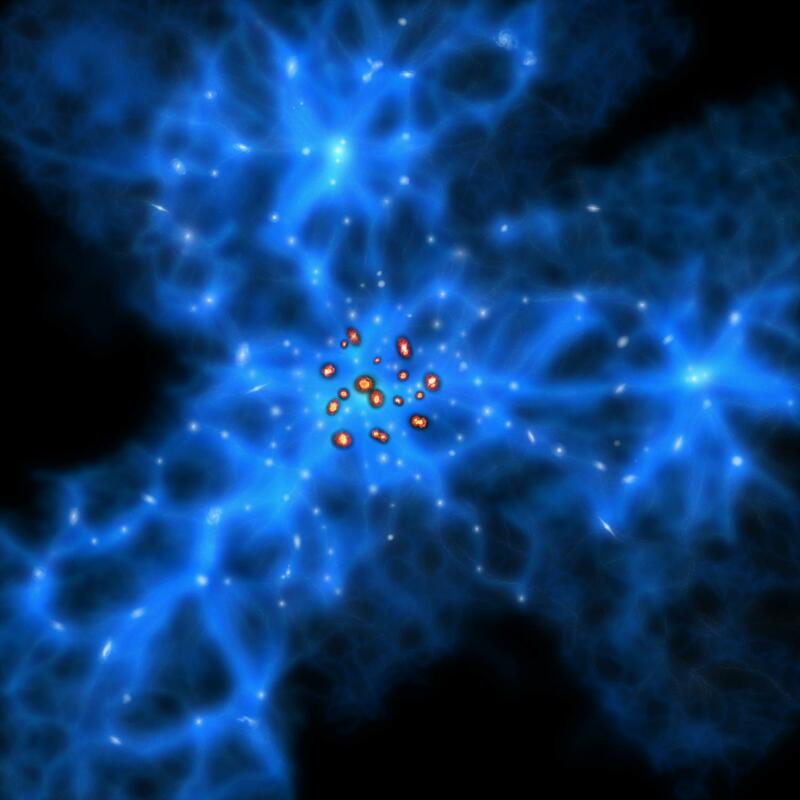 In the early days of the universe, these galaxies were areas of space where star formation was incredibly rapid - we're talking hundreds or thousands times faster than what we observe in the Milky Way. Unfortantely, they existed billions of years ago, and as such, are a little hard to come across these days. Current theories suggest they could be seen in areas where dark matter is highly concentrated, but also that they'd be covered in dust, making them difficult to observe in visible light. In response, a Japanese team led by Hideki Umehata, Yoichi Tamura, and Kotaro Kohno made extensive observations on a small area of the sky called SSA22 - the same sector housing the constellation Aquarius. After finding possible indications of these galaxies, they increased the sensitivity and resolution. This eventually helped them pinpoint nine distinct galaxies 11.5 billion light years away from Earth. And sure enough, these galaxies were within a dark matter filament web that formed some of the earliest structures of the universe. Naturally, the team doesn't plan to stop here. It will soon begin observations into earlier stages of the universe for additional clues on how it formed. But this is still a fascinating glimpse into our distant past, one which shows the starry sky is far more complex than it appears at first glance. I hope they find a lot of stuff out from this. Always interesting to hear how things worked that far back. It almost looks like the "hated" starlanes in some 4X games.